Microsoft's true wireless Surface Buds to rival Apple AirPods | What Hi-Fi? Microsoft is working on a rival to the Apple AirPods, according to internet rumours. 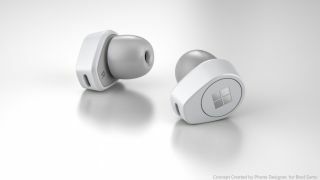 Following the launch of its Surface-branded headphones last year, Thurrott reports that Microsoft now wants a piece of the true wireless earbuds action. Numerous sources claim the computing giant is working on a pair of true wireless earbuds, with the codename Morrison. Like the AirPods, these headphones are thought to be truly wireless, in other words, they sit in your ears with no cables at all. They will feature built-in support for Microsoft's Cortana personal assistant and noise-cancellation tech, as well as a way of improving interactions "between a phone and the earbuds to make reading content easier on the phone." Whatever that means. And the release? This year is "plausible, but not guaranteed" the report notes. Since the AirPods first launched in 2016, wireless earbuds has quickly become a crowded field. Amazon is also believed to be launching its own model, while there are also excellent options from Sony, Sennheiser, Bose and more.